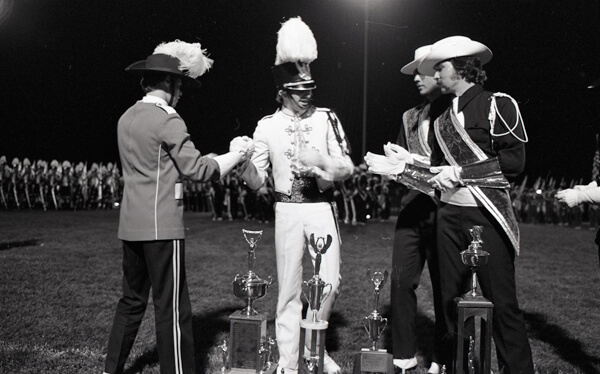 Drum majors from Santa Clara Vanguard, Blue Devils and Madison Scouts congratulate each other after a competition in La Crosse, Wis. on June 24, 1977. The Blue Devils took first place with a score of 79.75 — 4.25 points ahead of second place finishers Santa Clara Vanguard, and 8.75 points ahead of third place finishers Madison Scouts. The three corps would keep that order at the 1977 World Championships in Denver, Colo., ranking first, third and fifth.